Bosch Memory Darab License (optional): US $5,100. Naturally aspirated engine with intake above rear side panel. Water-cooled flat six-cylinder boxer engine with four-valve cylinder. Porsche six-speed sequential dog gearbox with pneumatically activated shift mechanism, active oil cooling and internal pressurized oil lubrication system. Lightweight, widened chassis using add-on carbon/kevlar parts. 90-liter fuel tank (FT-3 safety cell). Height-adjustable McPherson strut-type axle with adjustable spring mount and damper setting. SACHS gas pressure shock absorbers (through rod). Double coil springs (main spring and helper spring). Camber adjustment on lower wishbone. Adjustable bilateral blade-type anti-roll bar with adapted stiffness. Reinforced front axle cross rail. Rear axle track rod adjustable in length. Power steering with electro-hydraulic pressure feed. Light-weight wiring loom (prepared for ACO data logging). 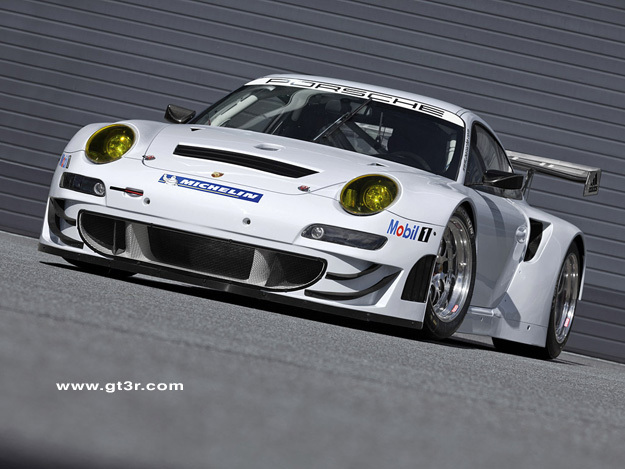 The new Porsche 911 GT3 RSR is ready to race. 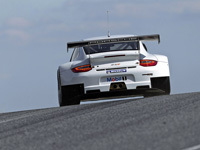 The top model of Porsche Motorsport's customer racing vehicles will head into the 2012 season with extensive modifications. Particularly striking at first glance are the changes to the body: the width of the new GT3 RSR has grown by 48 millimetres. Built to conform to the A.C.O. "LM" GTE regulations, the 911 represents the crowning pinnacle of a range of successful customer sport race cars that are based on the 997 type 911 GT3 RS street sports car. 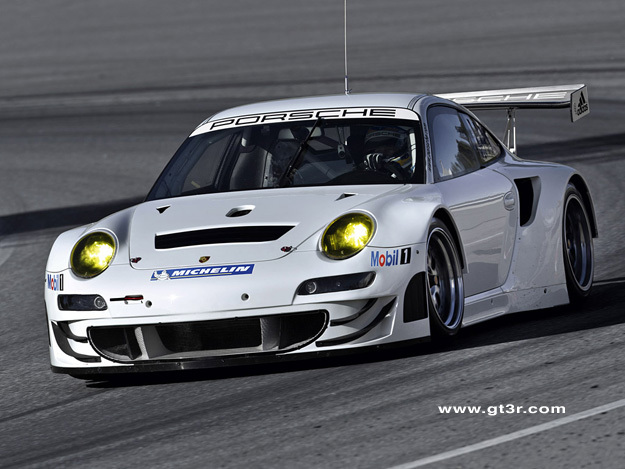 Sebring, Fla. – February 9 -- The new Porsche 911 GT3 RSR race cars, still in plain white livery as they arrived from the factory in the last week or two, made their world debut as three U.S. customer teams gave them their first race track test preparing for next month's 60th Anniversary Mobil 1Twelve Hours of Sebring Fueled by Fresh from Florida. 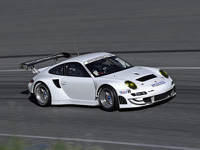 The top-of-the-line model of Porsche Motorsport's customer racing vehicles will head into the 2012 season with extensive modifications. Particularly striking at first glance are the changes to the body: the width of the new GT3 RSR has grown by 48 millimeters. Built to conform to the A.C.O. "LM" GTE regulations, the 911 represents the crowning pinnacle of a range of successful customer sport race cars that are based on the 911 GT3 RS (type 997) street sports car. Continuing to powering the new 911 GT3 RSR is a particularly efficient six-cylinder boxer engine with a four-liter capacity. With a mandatory air-restrictor, it generates 460 hp (338 kW) and drives the 310 millimeter-wide rear wheels. The diameter of the front wheels has increased by 30 mm to now measure 680 millimeters. 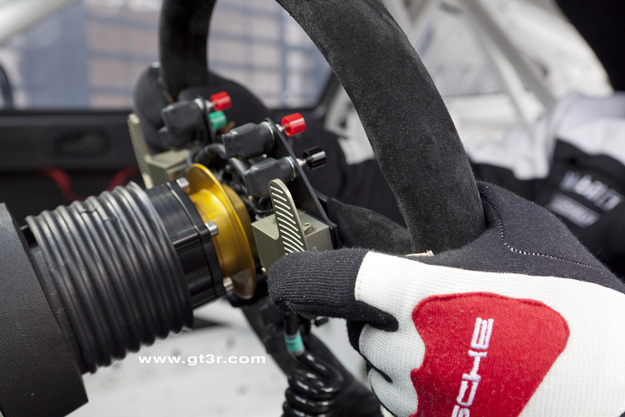 The Porsche sequential six-speed gearbox is operated via paddle shifts on the steering wheel. 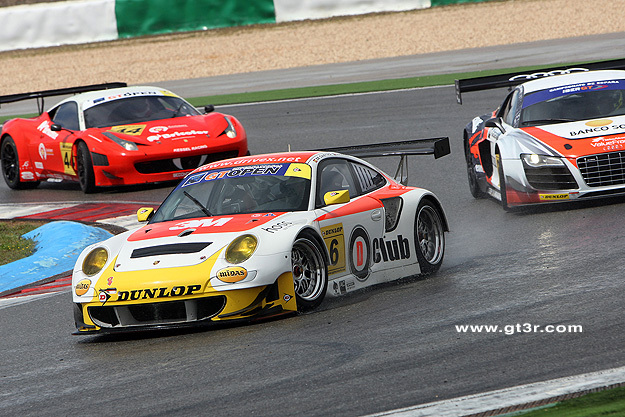 The four new 911 GT3 RSRs will be competing in the American Le Mans Series. The car can also compete at the Le Mans 24 Hours, the FIA World Endurance Championship, and the Le Mans Series, as well as the International GT Open and in other series and races. "Our customer teams can expect a technically mature, high performance race car with which they will be highly competitive at international long distance races," assures Hartmut Kristen, Head of Porsche Motorsport. 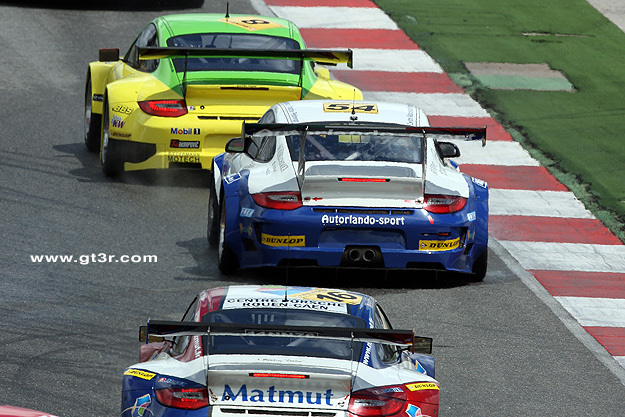 "Our test program on various international race tracks is currently running at full speed. We are very pleased with the car's performance and drivability." The 2012 GT3 RSR (MY 2012) undergoes the biggest change in bodywork in several years. Air intake is moved from the decklid to the rear quarter panels. P. Long is at the wheel in the below photos. 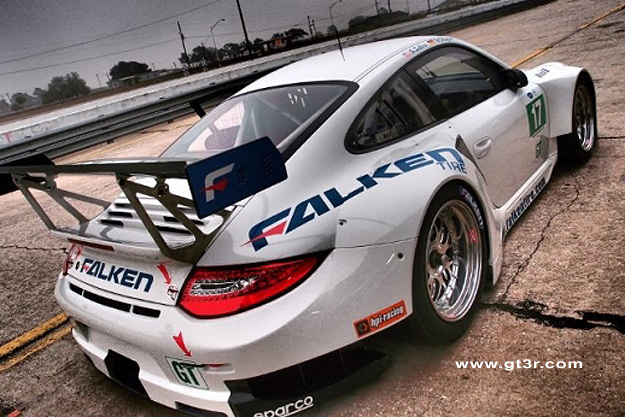 One of the four 2012 GT3 RSRs at the Sebring winter test. Note revised decklid, and massive bodywork. 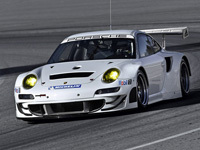 Manthey's 2012 RSR leading a current 997.2 GT3 R, with the IMSA/Matmut 2012 RSR in chase. 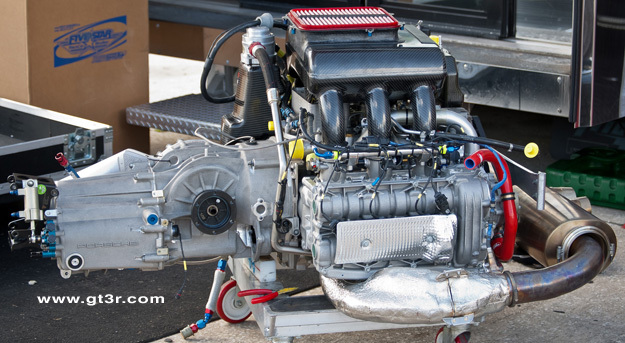 The powertrain as seen in the paddock at Sebring 12 hr 2012. 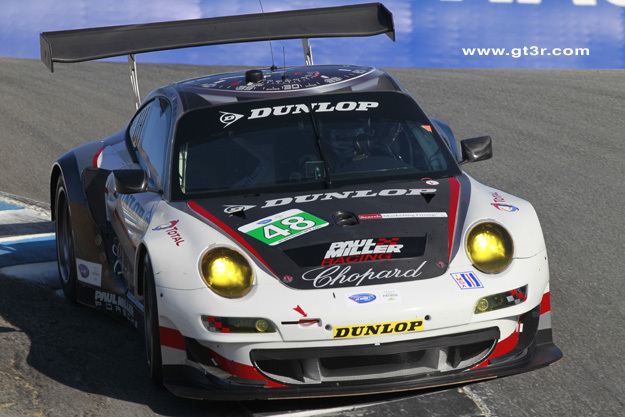 This belongs to the Flying Lizard car. 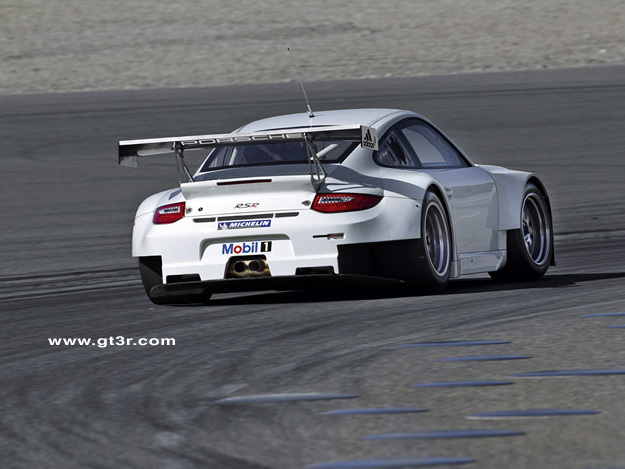 The Paul Miller Porsche GT3 RSR comes through the corkscrew at Laguna Seca's ALMS race.